Fat is an essential macro-nutrient used by the body for reasons ranging from cushioning the body to the production of hormones. Each gram of fat contains 9 calories, making it the most calorie dense nutrient. Due to fat's high nutrient density overconsumption of fat can lead to weight gain. Further trans fats and saturated fats may lead to increased risk of cardiovascular disease. For more information, see the list of unhealthy high fat foods to avoid. High-fat foods include avocados, tofu, nuts, seeds, fish, peanut butter, boiled soybean, flaxseed oil, cheese, and eggs. The daily value (DV) of fats to consume is 65 grams. 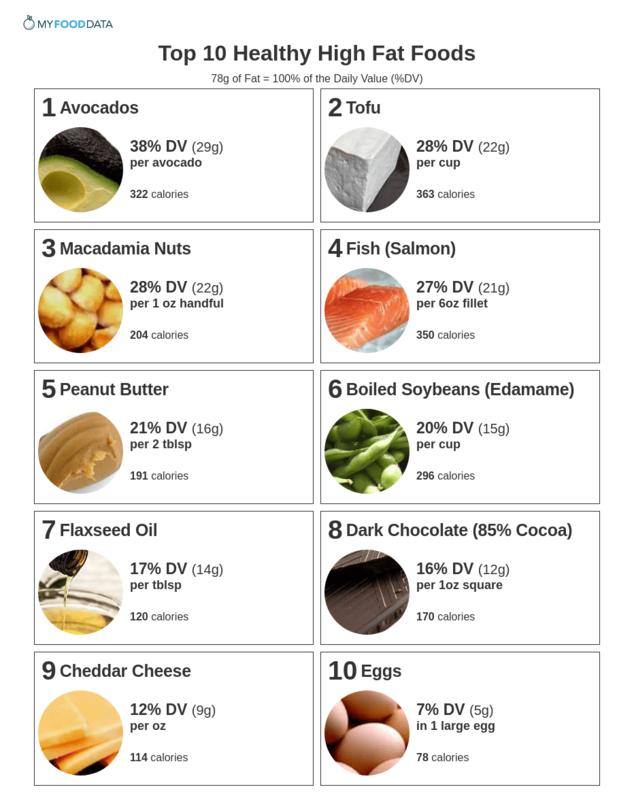 Below are the top 10 foods highest in fat, for more, see the complete ranking of 200 foods high in fat. See the ranking of fruits high in fat. See the complete list of nuts and seeds high in fat. See the list of fish high in fat. Other than soy, most beans contain very little fat. Other healthy oils include canola, avocado, walnut, sesame, and grapeseed. All of which provide 21% DV fat per tblsp. A whole 3.5oz bar of dark chocolate contains 66% DV of fat. -45-59% Dark chocolate contains 17% DV fat per oz. See all high fat dairy products.